​If you are an iPad or iPhone user, then you will need to know that there is a unique feature integrated on your iDevice. This feature is known as Assistive Touch and it comes in handy for protecting your device’s physical home button and volume key. The iPhone’s assistive touch feature ‘unravels’a small ‘bubble’ located at the edge of your screen, and once you tap on it, you’ll be presented with a ‘virtual floating panel’which gives you quick access to all your favorite apps, games, settings and quick toggle. The iPad or iPhone assistive touch feature helps you to easily interact with your device’s screen. This is useful for smartphones with bigger screen. Also Read: How To Enable Picture in Picture Mode On Your iPhone. If perhaps you’re not aware of the assistive touch feature on your iPhone or iPad, then you can easily enable it from your device’s Settings menu. Simply navigate to General Settings –> Accessibility, then scroll down to ‘Interaction Settings’ and from here, tap the “Assistive Touch” option and toggle the button to enable it. 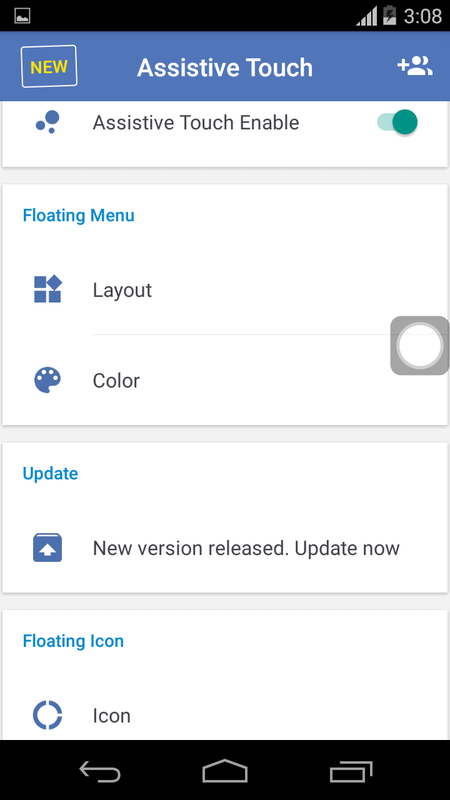 You can also go further to customize it to your preference by using the customize top level menu. Now diving back to the main article, we’ve figured out a way to bring iOS assistive touch feature on Android and this does not require root permissions. So if you’ve got your Android phone ready, here’s the apps that can bring iOS assistive touch on Android. Assistive Touch is an easy tool for Android device that allows you to get the exclusive iOS like assistive touch feature. The app is quite smooth, fast and easy to use. Now to begin with, simply head over to the Google Play Store and install Assistive Touch For Android. Once you open the app, you will notice a ‘small bubble on the edge of your device’s screen, this will be used to call-out the floating panel. By default, once you tap on the ‘small box’, you’ll be presented with a virtual floating panel with five shortcuts. There, we have the “RAM booster” which cleans and free up space on your device’s RAM, thereby speeding up your phone and saving battery. The “Home Button Shortcut” located at the floating panel of assistive touch, catapults you directly to your device’s home screen once you tap on it. You can also Lock your phone from the floating panel but this will require you to activate the device manager via the Settings menu. Now clicking on the Settings shortcut in assistive touch floating panel won’t take you to your device setting rather it’ll bring out a list of shortcuts you can toggle ON. 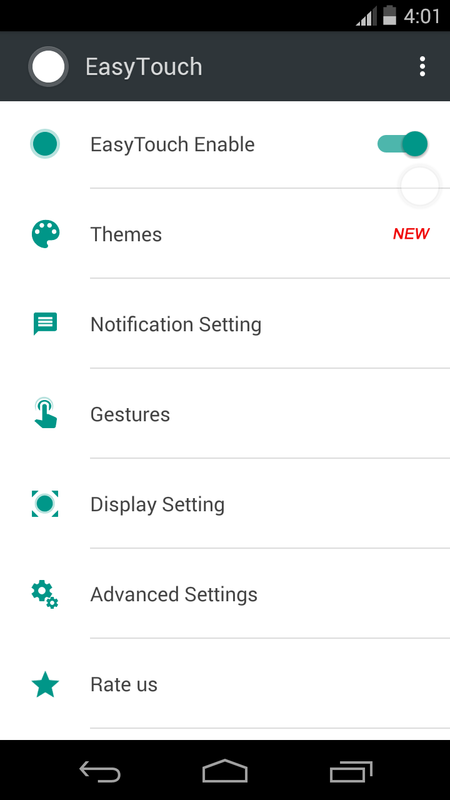 Assistive Touch for Android also brings an option to add quick actions, when you click on the ‘Favor’ icon, a list of ’empty boxes’ will appear, allowing you to add your favourite apps and games. When you open “Assistive Touch” on your Android device, you’ll be able to customize the ‘floating panel’ to your preference. The app’s first option allows you to enable or to disable the assistive touch. Now under the floating menu, we have the layout and this shows panel settings from where you can add shortcuts. Assistive Touch allows you to change the “floating panel” background color and you can change the small bubble icon too. We also have the display option & the gestures which determines how to call-out the floating panel. Assistive Touch is a must have app, as it mimic’s iOS assistive Touch feature. 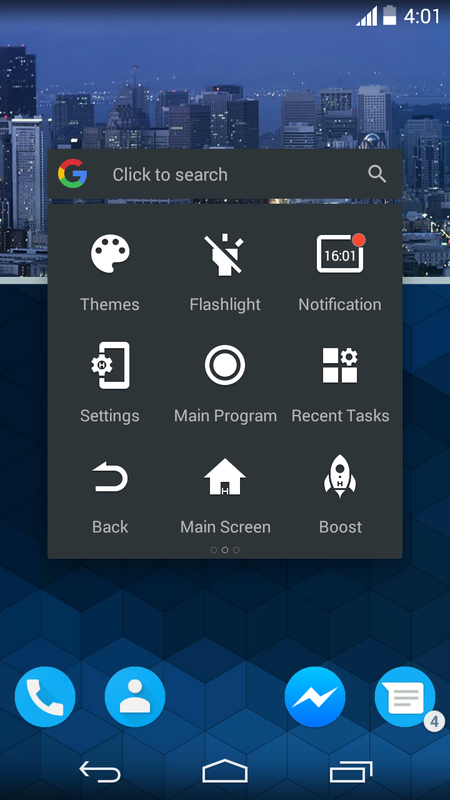 Easy touch is another assistive touch tool for Android that brings a ton of ‘advanced’ features to its abode. The app allows you to experience the iOS-like assistive touch in a more faster way. To get this one going, you will need to dive into the Google Play Store and install EasyTouch. Once after this, tap to open EasyTouch from your device’s app drawer and skip the introduction. Now a small bubble will pop-out from the edge of your screen, so you’ll need to tap on it and this will call-out the floating panel. 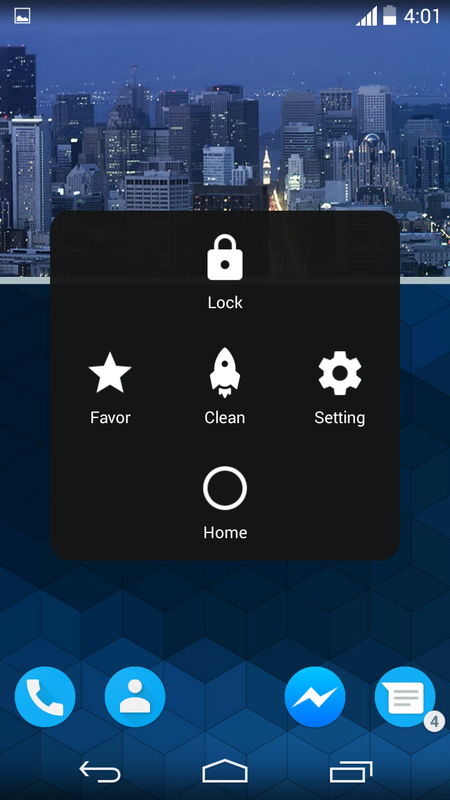 Similar to Assistive Touch for Android, EasyTouch brings a booster icon that serves as a clean master which helps to make your Android phone faster by cleaing up junk files. At top, we can see the Google search which comes pretty much in handy for variety of purpose. EasyTouch also unveils a “Back” button which will only start working once you enable the app’s accesibility service via your device Settings menu. Unlike the assistive touch, EasyTouch brings advance features as stated earlier on, you’ll be able to see the recent tasks on your phone and also turn ON the flashlight within the app’s floating panel. The Main Screen icon does it job according to its name, also similar to assistive touch, EasyTouch shows a lists of shortcuts to toggle ON when you tap on the Settings icon. EasyTouch brings customizations abilities, to edit an icon, simply tap and hold on any empty space. 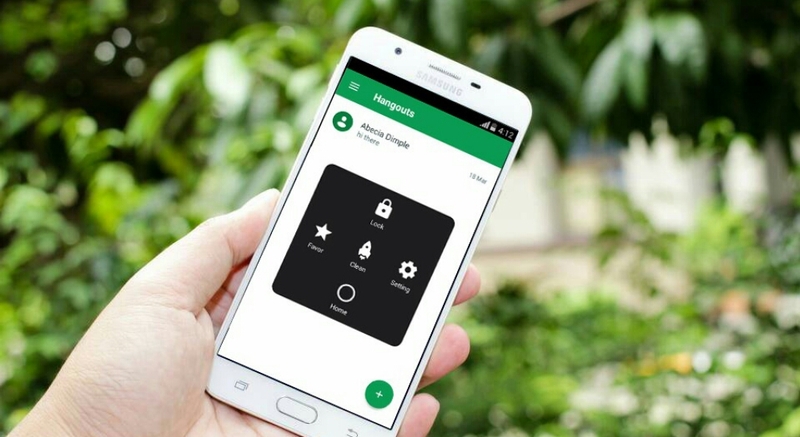 Swiping from the left or right of the “EasyTouch floating panel” gives you quick access to your favourite apps, games and contacts. When you open EasyTouch, you will be greeted with an easy to use and intuitive user interface. There are a ton of options you can tinker with, and when you dig in deep, you’ll discover that EasyTouch brings plethora features. In summary, the app is quite cool and handy, as it lets you to experience the iOS-like assistive touch feature on Android.